GOAL: The See-Food Scavenger Hunt is a fun activity meant to test you food-thinking, time-managing, riddle-solving, and photo-shooting skills. The goal is to, within a limited amount of time, take a picture of a food place or food item to satisfy a riddle to accumulate as many points as possible. The team that gathers the most points, wins. And a good knowledge of food, food places, and restaurants on Oahu. PLEASE SUBMIT THE NAMES OF YOUR TEAM AND ITS MEMBERS BY MAY 7, 2011 (SATURDAY) VIA FACEBOOK OR E-MAIL (hnlgrubclub@gmail.com). MEETING, STARTING, ENDING, TIME AND LOCATION: On May 14th, at 10:30 AM, you will meet at Ala Moana Beach Park. Specific location will be given at a closer date to the Hunt. You will be assembled in your teams and ready to go. 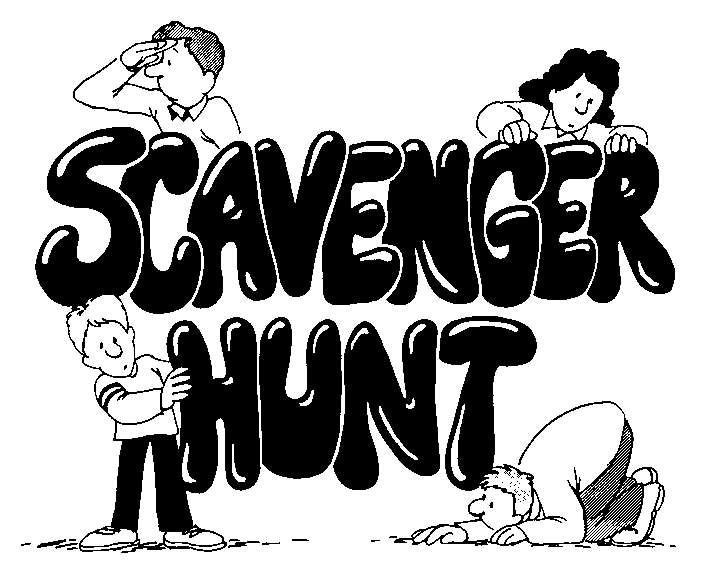 The scavenger hunt begins at 11:00 AM. You will have the next four hours, from 11:00 AM to 3:00 PM to take pictures answering the riddles given to you on your riddle sheet. Your team MUST be back at 3:0o PM. Any team NOT back on-time shall be disqualified. After 3:00 PM all teams that have submitted answers shall have their points tallied and calculated. During that process the Grub Club will have a barbeque. GATHERING POINTS: Your task will be to try and get as many points possible in the allotted time by taking pictures of the hinted item or place within the clue. Each riddle has a certain number of points based on the difficulty of the riddle. There may be more than one good answer to a riddle, and if I agree that your answer sufficiently satisfies the riddle, even though it is not the intended answer I will award full points. ANSWERS: The riddles will ALWAYS pertain to a restaurant, place that carries food, or a type of food item. The answer will NEVER be something that has NO food relation. BOUNDARIES: The answer to the riddles will be found in the area between Kalihi and Kahala. If you are heading to Kahuku for a picture of corn you are way off. If you are heading to Aina Haina to take pictures of cupcakes you are way off. I will not stop you from going out of bounds, but realize it will probably impact the amount of time you have to take pictures for answers. SABATOGE: You can even lie to another team what the answer is to throw them off. This rule is for you “cheaters”. PICTURES: Pictures serve as the teams’ answers to the riddle. To clarify the picture, the riddle sheet shall have a blank space for the team to write in what their picture is of. Please try to take clear pictures, as if I cannot tell what it is, you may not get points. ONE PICTURE, ONE RIDDLE: It is one picture to one riddle. No using multiple pictures to answer one riddle. No using one picture for several answers. TEAM IN PICTURES: Each picture should include a team member in it. ORDERING THE ANSWERS: The pictures need not be in order of the riddle sheet, but the corresponding file name or number should be apparent. Thus fill in the appropriate column. Basically, if I have no idea which picture is answering for what riddle you will not get points. So have a naming/ordering system. WINNING: The team with the most points will win. In the event of a tie, the team that comes in the earliest will win. In the event that the tied teams arrive roughly at the same time, then both teams will answer a trivia question dealing with quantity. The teams will both put in their best guess, and the team that puts in the closest answer to the actual quantity (without going over) shall win. SAFETY: Please be safe when driving and taking pictures. Do not do anything ridiculous for this contest. This is meant as a friendly competition among friends and we are going to have fun during it and at the end with the barbeque. NO LAWYERING: You all know me, so don’t lawyer your way with the rules to get more points. If you don’t understand something ask beforehand, not during the contest, and I will provide a clarification to all participants. I reserve the right to make judgment calls before and during the hunt. At the end, only a technicality, like messing up on adding points, will change the winners. There is no appeals court for the Grub Club. This rule is for all my fellow attorneys.